Workers at U.S. computer technology company Oracle's Korean branch launched a general strike on Wednesday demanding higher wages and job security. A vote by unionized workers last week showed 96 percent supported a strike. They are holding a protest rally in front of Oracle Korea's offices in Samseong-dong, Seoul. Kim Chul-soo, the head of Oracle's labor union, said, "Most of the 1,000 employees have not had a pay raise since they joined the company in 2009. A section director who joined the company in 2009 earns just W2.3 million a month, while a worker who was hired later makes W4 million a month" (US$1=W1,075). Kim said this prompted some workers to quit and try to rejoin the company to get better pay. On top of that, Oracle has been downsizing since last year, shifting its focus from servers to the cloud, which resulted in the loss of around 200 jobs. More than 100 claim that they were shown the door against their will. Oracle said the downsizing came at the orders of headquarters and it is "negotiating possible wage hikes" with workers. The strike exposes the ugly underbelly of what it is like to work for a foreign company that was once praised for its modern approach and strict adherence to the nine-to-five workday. In reality, workers often find themselves anxious for their jobs and little better off than cyber-serfs. One IT industry source said, "Most foreign IT companies have key operations like R&D based overseas and only the marketing operations are based in Korea. As a result, poor results or a shift in the main area of business results in downsizing and layoff pressures." The Korean operations of global IT companies whose earnings have waned face a similar predicament. Microsoft realigned its main business structure from software to cloud and has been downsizing its workforce since last year. Workers formed a labor union in July last year in an attempt to stem job losses, but around 50 were fired. "As soon as an employee is hired, he or she faces immediate pressure to generate earnings and suffers extreme stress," a Microsoft Korea staffer said. Hewlett Packard Korea let 400 workers go over the last three years, 120 of them last year. 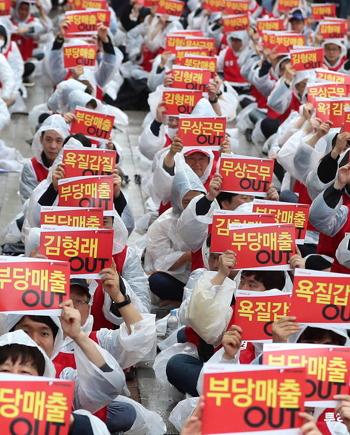 Kim Yong-hwan, head of the labor union, said, "There are around 20 more workers who have been placed on standby." At IBM Korea, which once boasted a staff of 2,700, the workforce has shrunk to 1,500. The company started an early retirement scheme in March to get rid of workers. One person who worked for IBM for 20 years said, "After earnings growth slowed considerably since 2010, an order was issued to each department to lay off a set number of workers. Staff were assigned to do marketing on companies that lack buying power or were dispatched to call centers." Such measures would have drawn a huge public outcry if they were committed by a Korean company. Moreover, foreign companies are not obligated to reveal their earnings figures, wages and dividends since they usually operate as limited-liability firms. They take advantage of this rule to transfer the money they earn in Korea to headquarters while failing to pay proper taxes in Korea. Oracle Korea was slapped with a W300 billion penalty tax last year for transferring domestic earnings to headquarters overseas. It denies the allegations and has filed a lawsuit. The National Tax Service believes the branch transferred W2 trillion to headquarters from 2008 to 2014. The union at Oracle Korea said, "All of the profits generated from Korea are sent to headquarters in the U.S. Workers in Korea are being denied their rightful compensation because of this opaque management style." The heads of the Korean operations of Apple, Google and Facebook appeared in a National Assembly hearing last year and were unable to tell lawmakers how much their companies earn in Korea. Louis Vuitton, Chanel, Hermes and other foreign luxury labels are also guilty of such practices at their Korean offices. Unionized workers at Chanel Korea, which consists of around 300 sales staff, went to work in T-shirts displaying slogans saying "higher wages" and "more staff" instead of their uniforms in March and April. Chanel Korea's labor union claims that 70 percent of its members earn less than minimum wage and do not benefit from pay-scale increases according to their experience. The strike ended in April with management agreeing to raise the base wage and relocating workers. But the controversy over how foreign luxury companies treat Korean staff despite massive profits here still lingers.